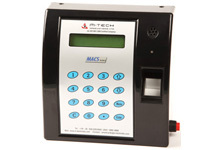 M-Tech offers complete Biometric Readers solutions of Time Attendance/Access control system with hardware, software & post delivery implementation support. MTB is the type of Biometric Readers known for being completely user friendly modular design system. Biometric Readers work on standalone as well as on network mode. Attendance report � Muster, Total Work Hrs., Extra Work Hrs., Late coming etc. Minimum human interference & monitoring required. Readymade reports for Payroll Integration. Cost effective & flawless solution to small/medium/large enterprises.